The update fixes errors and improves the platform stability. We remind you that support for older versions of operating systems, including Windows XP/2003/Vista, has been discontinued. The minimum acceptable OS version for the client terminal is Windows 7. To support shared projects, we have updated the protocol of operation with the MQL5 Storage. Therefore, you will need to perform a checkout of all data from the storage after the platform update. Data stored at the MQL5 Storage will not be lost or affected during the update. We recommend that you perform the Commit operation to send all local changes to the MQL5 Storage before updating. Fixed errors and improved the platform stability. MetaTrader 4 update will be released on November 9, 2018 in beta mode. The update fixes errors and improves the platform stability. All traders are invited to join the new version test. To receive the update, connect to the MetaQuotes-Demo server located at demo.metaquotes.net:443. The update will be installed via the LiveUpdate system. 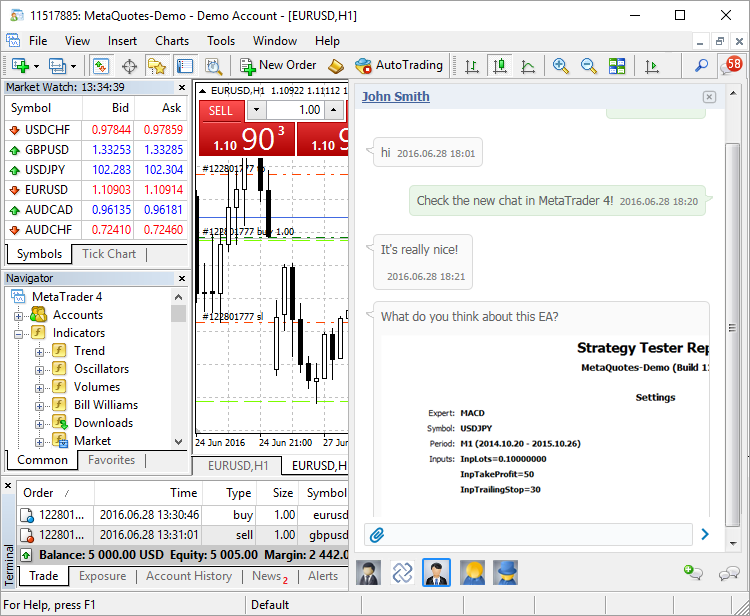 The release build of the MetaTrader 4 platform will be issued after the test. A month ago, Microsoft released a major update of their operating system Windows 10 Creators Update (version 1703). After installing this update, some users were unable to run MQL4 programs in their terminals. This issue has been fixed in the new MetaTrader 4 platform build 1080. Now, Expert Advisors and indicators will run on charts correctly, while recompilation using the updated MetaEditor is not required. Support for MetaTrader 4 client terminal versions below 1065 will be discontinued on the 1st of October 2017. Unsupported terminal builds will not be able to connect to new server versions. We strongly recommend that you update your terminals in advance. The release of MetaTrader 4 platform is connected with the release of Windows 10 Insider Preview build 15007. Due to security updates in the new Windows 10 system version, MetaTrader 4 client terminals could occasionally fail to start. Install the new platform version in order to prepare for the upcoming Windows 10 update. We have fixed some bugs based on crash reports. Added chat enabling traders to chat with other MQL5.community members. Specify the desired user's login in a message recipient's section to send a message directly to this user's mobile device. Added ability to edit indicator levels. Added interface translations into Indonesian and Hindi. A new design of messages. Now, MQL5.community messages and push notifications from the desktop platform are displayed as chats similar to popular mobile messengers. Now it is possible to switch to one of the 22 available languages straight from the platform. Choose any UI language from the "Settings" section ("About" in iPad) without changing the language setting of your device. Fixed an error which prevented execution of MQL4 applications in terminals running in 32-bit Windows 10, build 1607. Fixed occasional incorrect display of the Search and Chat buttons. Fixed occasional duplicate welcome-emails delivered to the terminal when opening a demo account. Added new 'void *' pointers to enable users to create abstract collections of objects. A pointer to an object of any class can be saved to this type of variable. It is recommended to use the operator dynamic_cast<class name *>(void * pointer) in order to cast back. If conversion is not possible, the result is NULL. Added support for the operator [ ] for strings. The operator enables users to get a symbol from a string by index. If the specified index is outside the string, the result is 0. The CopyXXX function that copies history and tick data has become faster. Fixed deletion of multiple graphical objects with the specified prefix using the ObjectDeleteAll function. Before the update, the remaining objects could be displayed in a wrong order after the execution of this function. Fixed occasional incorrect order of graphical objects display after changing the timeframe. During terminal synchronization with the virtual server, charts without Expert Advisors are ignored now, even if custom indicators are running on these charts. If you need to migrate a custom indicator, run it on the chart of an "empty" Expert Advisor that does not perform operations. Such an Expert Advisor can be easily generated using the MQL4 Wizard in MetaEditor by selecting "Expert Advisor: template". This update is to ensure that indicators are migrated on purpose. You can now synchronize Expert Advisors and custom indicators whose names contain non-Latin characters (e.g. Cyrillic or Chinese characters). Simplified demo account creation dialog. You do not have to fill the large form any more. Simply specify basic data and select trading parameters: account type, deposit and leverage. The format of the executable EX4 files has changed to implement the new features of the MQL4 language. All EX4 applications compiled in previous builds of MetaEditor will work properly after the update. Thus, the upward compatibility is fully preserved. EX4 programs compiled in build 970 and above will not run in old terminal builds - backward compatibility is not supported. Added support for abstract classes and pure virtual functions. Abstract classes are used for creating generic entities, that you expect to use for creating more specific derived classes. An abstract class can only be used as the base class for some other class, that is why it is impossible to create an object of the abstract class type. A class which contains at least one pure virtual function in it is abstract. Therefore, classes derived from the abstract class must implement all its pure virtual functions, otherwise they will also be abstract classes. Here Sound() is a pure virtual function, because it is declared with the specifier of the pure virtual function PURE (=0). If the constructor for an abstract class calls a pure virtual function (either directly or indirectly), the result is undefined. However, constructors and destructors for abstract classes can call other member functions. Added support for pointers to functions to simplify the arrangement of event models. Pointers to functions can be stored and passed as parameters. You cannot get a pointer to a non-static class method. Added TERMINAL_SCREEN_DPI value to the ENUM_TERMINAL_INFO_INTEGER client terminal property enumeration — data display resolution is measured in dots per inch (DPI). Knowledge of this parameter allows specifying the size of graphical objects, so that they look the same on monitors with different resolution. Added TERMINAL_PING_LAST value to the ENUM_TERMINAL_INFO_INTEGER client terminal properties — the last known value of a ping to a trade server in microseconds. One second comprises of one million microseconds. DRAW_NONE buffers (no graphical constructions) now do not participate in a chart window minimum and maximum calculations in custom indicators. Fixed generating events related to mouse movement and mouse button pressing over objects of OBJ_LABEL and OBJ_TEXT types. Previously, the events were generated incorrectly if they were within other objects of OBJ_RECTANGLE_LABEL and OBJ_RECTANGLE types. Fixed plotting zero-height histogram bars in custom indicators. Previously, such bars were not displayed, while now they have a height of 1 pixel. Fixed searching for trading symbols when comparing available trading symbols of a signal provider and subscriber. Fixed use of spread in fxt file if the current spread is used in the test settings. Fixed a few Market showcase display errors. Fixed search of words by files in "Match Whole Word Only" mode. Added moving to a file by double-clicking on the necessary file's compilation result line. Fixed display of some control elements in Windows XP. Now, you can set a PIN code to access the application. This will provide additional protection for your accounts even if you lose your mobile device. Enable "Lock Screen" in the application settings. By default, the PIN code is similar to the one used to access the one-time password generator. Also, the new version includes multiple improvements and fixes. The new version of the MetaTrader 4 Web Platform features faster chart performance, which is provided by the use of the new WebGL technology — now even with multiple running indicators, the web platform maintains optimal performance. The web platform interface has additionally been translated to Hindi, Uzbek and Ukrainian. Added a link to the video tutorial "How to rent a virtual platform" into the Virtual Hosting Wizard dialog. Watch the two-minute video to learn how to easily launch a trading robot or copy signals 24/7. Fixed sorting of MQL4 programs in the sub-folders of the Navigator window. Applications are sorted by name. Fixed drawing of the network connection status indicator on ultra-high-definition screens (4K). Fixed display of the print preview window in the News section. A full-featured search function has been added to the log viewer of the terminal, Expert Advisors, Strategy Tester and Virtual Hosting. You can search forward and backward, search for whole words and toggle case sensitivity. Added a link to the tutorial video "How to assemble a trading robot" to the MQL4 Wizard. Watch the three-minute video and develop a trading robot without writing a single line of code. Fixed the value returned by the SignaBaseTotal function. In some cases, the function could return a zero value instead of the total number of signals available in the terminal. Fixed editing of graphical object visibility on different timeframes from MQL4 programs. In some cases, the object could be invisible on a chart after changing this property. Fixed display of price values and SL\TP levels in testing results. The terminal interface has been completely adapted for ultra-high-resolution (4K) displays. All user interface elements are properly displayed on large screens. On smaller screens, the UI elements are automatically enlarged for better readability. Fixed a bug that could occasionally cause "Error writing EX4" during compilation in Windows 10. Fixed a bug that could occasionally cause errors while loading external DLLs in scripts and Expert Advisors. Fixed migration of trading environment with a custom indicator containing an EX4 library call, if the indicator is called from an Expert Advisor. Fixed error notifications on the signal subscription page. For example, notifications about the absence of required symbols for copying, about different trading conditions, etc. Fixed arrangement of open windows, if one of them is maximized. Open files can be tiled, cascaded, arranged vertically and horizontally using appropriate commands of the Window menu.